Sixty years after the AK-47 went into production, Mikhail Kalashnikov says he does not stay awake at night worrying about the bloodshed wrought by the world's most popular assault rifle. "I sleep well. It's the politicians who are to blame for failing to come to an agreement and resorting to violence," Kalashnikov said Friday at a ceremony marking the birth of the rifle, whose initials stand for "Avtomat Kalashnikov." It was before he started designing the gun that he slept badly, worried about the superior weapons that Nazi soldiers were using with grisly effectiveness against the Red Army in World War II. He saw them at close range himself, while fighting on the front lines. While hospitalized with wounds after a Nazi shell hit his tank in the 1941 battle of Bryansk, Kalashnikov decided to design an automatic rifle combining the best features of the American M1 and the German StG44. 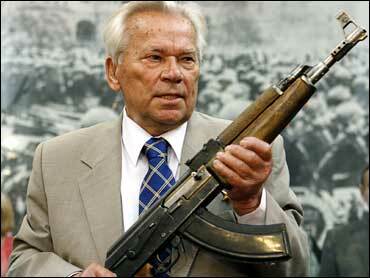 "Blame the Nazi Germans for making me become a gun designer," said Kalashnikov, frail but sharp at age 87. "I always wanted to construct agriculture machinery." Since production began, more than 100 million AK-47s have been made — either at the home factory in the central Russian city of Izhevsk, under license in dozens of other countries, or illegally. Sergei Chemezov, director of the Russian arms export monopoly Rosoboronexport, said nearly a million a year are produced without license. The AK-47 has been a mainstay in wars, coups, terrorist attacks, robberies and other mayhem. Its popularity comes from being rugged and easy to maintain, though its accuracy is not high. It proved ideal and extremely reliable for warfare in jungle or desert — easily assembled and able to keep firing in sandy or wet conditions that would jam a U.S-made M-16. "During the Vietnam war, American soldiers would throw away their M-16s to grab AK-47s and bullets for it from dead Vietnamese soldiers," he said. "I hear American soldiers in Iraq use it quite often." The simplicity and reliability of the AK-47 made it a favorite of rebel movements worldwide — it's even featured on the Mozambique flag. Keen to support anti-colonial movements in Asia and Africa, the Soviets proliferated the rifle, sometimes for free, to pro-Soviet regimes or insurgents. In 2005, Venezuelan President Hugo Chavez, who styles himself as a leader of the fighting against imperialism, ordered 100,000 for his army. "The Kalashnikov rifle is a symbol of the creative genius of our people," President Vladimir Putin said in a statement read to Kalashnikov at the ceremony in the Central Russian Army Museum. "It's a huge and splendid celebration," said Nikolai Shvets of Rosoboronexport. "For another 20 years, the AK-47 will remain unsurpassed by any other automatic rifle in the world." Kalashnikov is still active and prolific — he tours the world as a Rosoboronexport consultant helping strike new arms deals, and has written several books on his life, about arms and about youth education. "After the collapse of the great and mighty Soviet Union, so much crap has been imposed on us, especially on the younger generation," he said. "I wrote six books to help them find their way in life." He said he is proud of his bronze bust installed in his native village of Kurya in the Siberian region of Altai. He said newlyweds bring flowers to the bust. "They whisper 'Uncle Misha, wish us happiness and healthy kids,"' he said. "What other gun designer can boast of that?"